This enchanting house, "Li'l Blu", is in downtown Wilmington, NC. It offers 2 bedrooms with queen beds in each and 1 with an additional single bed, a separate dining room, comfortable living area with a fireplace for romantic winter evenings or go out the back doors and be surrounded by decks, a large pond and comfortable, spacious seating and dining areas. 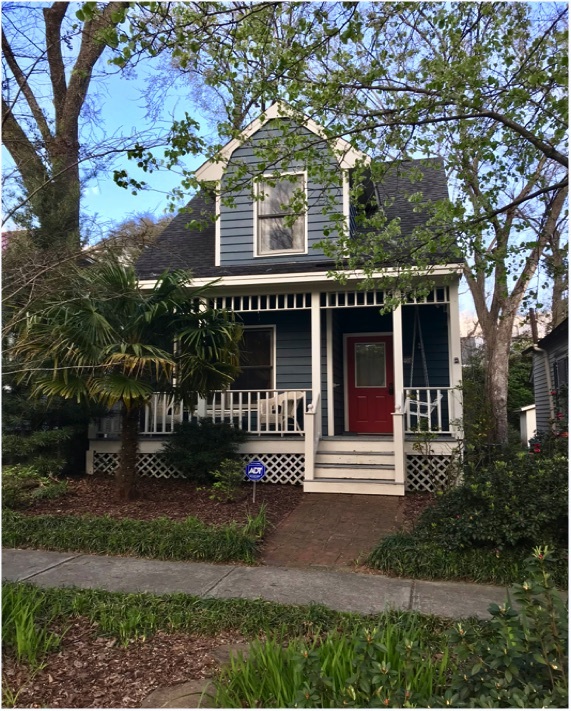 Stroll down this attractive, historic, residential street and within 2 blocks you can be at Cape Fear River (click HERE for bike, canoe and kayak rentals) or enjoy great antique shops, art galleries and events (click HERE for calendar). Also on that link, there is Fourth Friday Gallery Night info, restaurants, pubs, bakeries and many exciting year-round activities throughout downtown. The Battleship USS North Carolina offers a fascinating tour of its World War II involvement, or, if you are more interested in film and television production, there is the Screen Gems Studio tour. If you want to just sit and take it all in, be sure to book a horse and buggy tour of downtown; it will take you right by Li'l Blu! This house is also just a half mile stroll to the Farmer's Market (held roughly from mid April through November) or in the evening there are comedy and night clubs within walking distance: Downtown Sundown Concert Series is nearby between Princess and Water Streets this year. There are even golf courses and tennis courts if you want to be more active or even paddle or bike around Greenfield Lake; it's amphitheatre offers seasonal events to investigate too. NC Aquarium is at Fort Fisher and is an outstanding experience also. By far, the most popular activity are the beaches; it is just 10-15 iles to Wrightsville or Carolina Beaches where you can spend a relaxing day in the surf and sun! Be sure to Google "Wilmington, NC" in October for info about their Oktoberfest, too. Want a house all to yourself? Peaceful and close to everything? And the airport just 5 miles away?